A study of cruise prices shows that the price of upmarket suite accommodations are up compared to the 2016 sailing season while average prices for balcony staterooms and ocean view cabins have fallen from last year. The study, by monitoring service Cruisewatch.com, found that the price of suites aboard more than a dozen major cruise lines increased an average of two percent over last year while prices dropped an average of six percent for balcony cabins and up to 10 percent for ocean view staterooms. 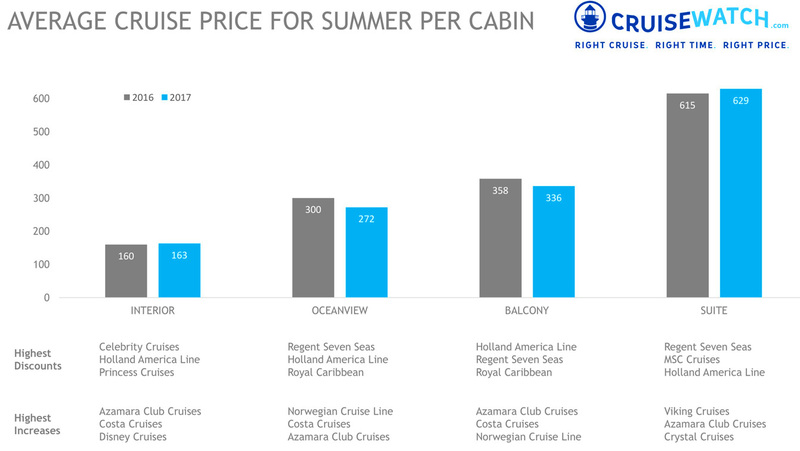 Perhaps indicative of stable demand by the most price-conscious cruise passengers, the study showed the price of interior cabins was generally stable. "Our study shows that there are still good savings to be found for a summer cruise vacation this year,” Britta Bernhard, co-founder of Cruisewatch.com, said. “While some lines raise prices across the board, other are reducing. This might be a good year to utilize [our service] to identify the best deals." The website compared price changes for 4,383 cruises in 2016, departing in the summer period of May to September, with 4,884 sailings leaving in the same period this year. To get comparable data, the study then compared the price per day at the fixed point of May 1st for both years. Suites are getting more expensive over time, though average prices showed only a modest increase over last year. Average suite prices increased to $629 per day from $615 in 2016. Viking, Azamara and Crystal Cruises had the largest price increases while Regent Seven Seas, MSC Cruises and Holland America reduced their fares. Due to highly variable cabins and limited inventory, this category is the most difficult for which to draw valid conclusions about the reason(s) for the increase, according to the company. Balcony staterooms dropped overall, going from an average of $358 to $336 per day. The reduction mostly came from lowered initial prices, as the number of price drops is largely unchanged compared to last year. 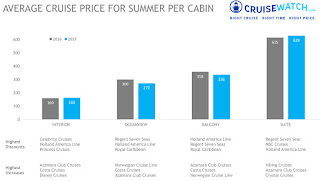 However, prices were again highly variable by line, with Azamara increasing prices 33 percent, Costa hiking fares 18 percent, and Norwegian Cruise Lines (NCL) raising prices 16 percent. Going in the opposite direction, Holland America and Regent Seven Seas dropped prices of their balcony staterooms and average of 20 percent, and Royal Caribbean reduced fares 15 percent. The largest price drops on a percentage basis were in the ocean view cabin category, which showed the most marked year-over-year decline. While these porthole and window cabins traded slightly above initial price last year, lines were giving an average seven percent discount this year. However, that figure also varied by cruise line. NCL was among those countering the overall trend and led those lines raising prices, with an increase of 27 percent on average. Costa Cruises raised its ocean view fares an average of 24 percent, while Azamara raised the category’s prices an average of 19 percent. By contrast, Regent Seven Seas lowered its ocean view stateroom prices by 26 percent followed by Holland America, which dropped fares an average of 16 percent, and Royal Caribbean, which cut prices by 10 percent. Interior cabins showed a mostly stable trend. The amount of price discounts compared to the initially published price was also stable. Interior cabins traded around 94 percent of the initial price both years, although there were marked differences on a line by line basis. The top three lines increasing prices were Azamara with an average increase per day of 24 percent, Costa with 22 percent hike and Disney with an 11 percent increase. Among the lines dropping prices were Celebrity Cruises with a 13 percent drop, and Holland America and Princess Cruises, which each showed a 10 percent decline. 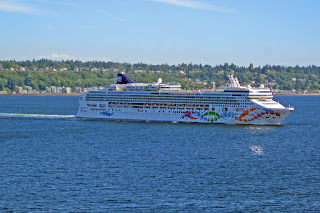 As astute cruisers know, the fare is just the starting point when calculating the all-in cost of a cruise. Some lines offer fares that are nearly all-inclusive while others have numerous additional charges, some of which are essentially mandatory and others that are truly optional. For more detail, please see TheTravelPro’s article, Counting the Cost of a Cruise. The search engine Cruisewatch.com offers consumers free price drop monitoring. The website processes price data using intuitive software that will help consumers find the perfect cruise: at the right time, at the best price. Users can receive automatic alerts when prices are reduced or when good deals are on the horizon. A price forecast is built into its website. 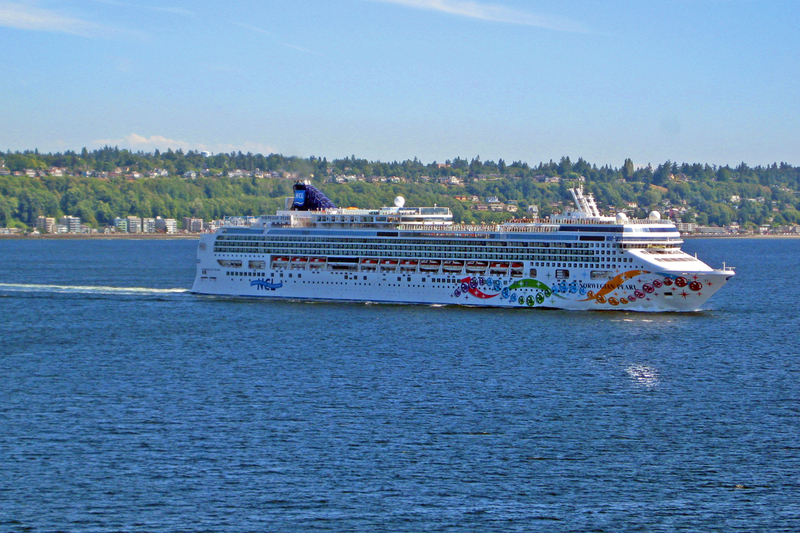 "Cruise lines invest massive amounts of resources into revenue optimization. We are leveling the playing field and offering consumers up-to-date technology to make the right decisions," according to Bernhard.